The encryption bill, intended to help police and national security agencies intercept online communications, could turn Australian companies ‘into Huaweis’, technology chiefs have warned. Atlassian co-founder and CEO Scott Farquhar; former CEO of NUIX Eddie Sheehy, and Fastmail chief of staff Nicola Nye, claimed the Telecommunications and Other Legislation Amendment (Assistance and Access) Bill 2018, which passed in bizarre circumstances in December, was already making local businesses ‘untouchable’ in some overseas markets. 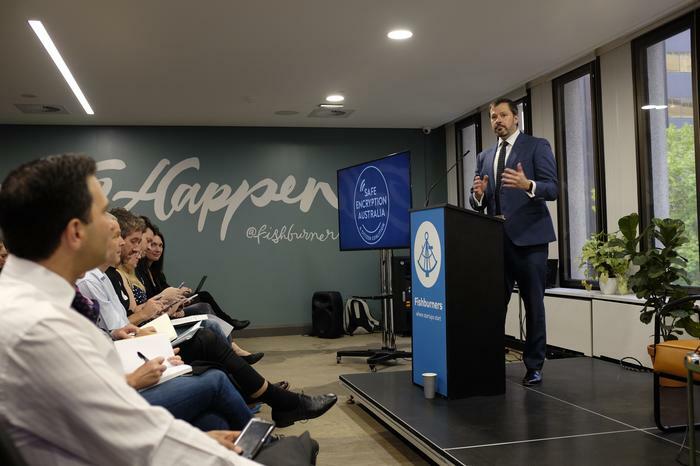 “This legislation as it’s currently written has the ability to turn many Australian companies into Huaweis, that are untouchable in different places,” Sheehy told the audience at a Safe Encryption Australia event organised by InnovationAUS and StartupAUS. Farquhar claimed a friend who runs an energy company had lost business opportunities as a direct result of the bill. “He was working with the Malaysian government to do some stuff around energy in Malaysia. And when this came out, the Malaysian government said – hey we’re not really sure we want to engage with you anymore,” Farquhar said. “You can make the argument, well, why would an energy company be covered by this bill in the first place? But could they be compelled to do something in some way? It just creates uncertainty for us in a business environment, particularly working with overseas multinationals and overseas governments that want to make sure their own security is maintained,” he said. The panel were highly critical of one of the ‘myths’ included in an encryption bill ‘mythbuster’ published by Director-General of the Australian Signals Directorate Mike Burgess after the bill had passed. “Are you kidding me?” said Nye. Fastmail’s Twitter feed had been flooded with comments from customers saying they are leaving the service or engaging a rival not based in Australia because of a lack of trust, Nye added. “So absolutely damage to the business already and it’s only been two months,” she said. Nye described the bind on tech companies, restricted from speaking out against the bill through fear of damaging their own reputation. “If we go out in public and try to say forcefully hey what is this law doing, that’s going to cause more people to leave our service and trust us even less. It’s a very tricky line to run here,” she said. Although some of Burgess’ myths stood, Sheehy said, he could not deny the impact on reputation suffered by Australian companies. “This one, I don’t think he knows what he’s saying. He’s never run a company, he’s never employed people, he’s never had to run the P&L accounts and pay wages, he’s never had to front the customer and say ‘It’s alright, trust me’ because that just doesn’t work,” Sheehy said. “The people who wrote this bill didn’t take into consideration the people on the ground. The blood, sweat and tears that goes into creating a start-up and building it year after year after year. And the passion that goes into it. And then just to have somebody in Canberra write some rules because he or she thinks it works,” he added. Labor MP Ed Husic, who also spoke at the event, said his party would “fix these terrible laws” despite the legislation passing last year with the party’s support. “I had an absolute ouch moment when you made the Huawei analogy, because that’s a pretty powerful way to describe it,” Husic said. Husic said Labor was committed to reforming the laws, regardless of whether or not it wins government at this year’s federal election.